Extreme Makeover…On a Tight Budget! | Robert S. Minch, D.D.S., P.A. Remember the old show”Extreme Makeover”?? That’s the one where people with multiple cosmetic issues were “fixed” and the end result was always amazing. More often than not, the featured person had their teeth/ smile restored as part of the package and more often then not, the treatment included porcelain veneers. Porcelain Veneers can be an awesome cosmetic treatment because they provide the patient with the whiter, cleaner more beautiful teeth they so often desire. Additionally, the porcelain material is strong and very esthetic, virtually guaranteeing a beautiful, long lasting result. 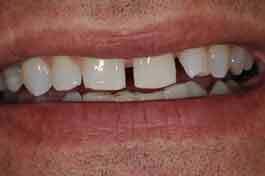 However, porcelain veneers can be a very expensive treatment that can take several months to complete. Cosmetic Bonding is a different type of service that also provides a makeover effect but can be much less expensive and completed in one appointment. Tooth colored bonding material is layered onto the tooth, shaped and polished resulting in whiter teeth that are more ideally shaped. The disadvantage to this type of treatment is that the bonding material is not as strong as the porcelain veneer and the skill of the dentist directly determines the esthetic result. As regular readers of this blog know, this is exactly why I have twice traveled to Brazil in order to study with Dr. Newton Fahl- the Rockstar of Cosmetic Bonding. 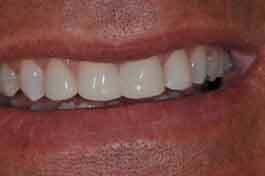 Steve is a perfect example of why Cosmetic Bonding can be a very useful tool in creating a new smile. As is shown in the “before” picture above, Steve had multiple spaces between his front teeth as well as some minor crookedness. Braces would be the ideal treatment followed by porcelain veneers but Steve needed a dynamite result immediately, due to his starting a new job. So we discussed exactly what his desired result was followed by my getting models of his teeth- I created the intended shape of the teeth on the models using wax in order to better visualize exactly what the final result would be. This one step is SO important and separates out a mediocre result from a truly beautiful one. Most dentists do not take the time to do a mock up on a model before the actual appointment and most do not layer different colors on the tooth to create a truly lifelike, natural looking tooth. These extra steps separate the average dentist form the true artists. Since we took the time to do a wax up on a model and visualized the final result, the actual appointment was stress free and fun. In little more than 2 hours, Steve was admiring his new smile in the mirror. The treatment is affordable and quick and, in many cases, can be very long lasting. So if you are unhappy with your smile but are afraid that any treatment will be too expensive, come on in and let’s talk about it. Stop by for a complimentary consultation and we can discuss the options. You may be very surprised at what is possible! !